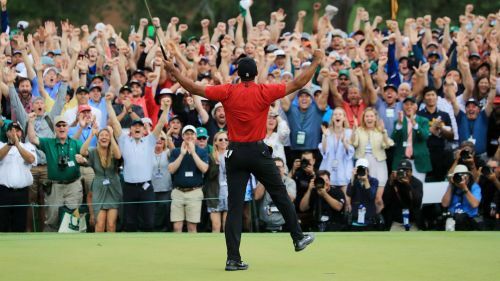 Tiger Woods celebrates in front of the crowd at the 18th green. Woods carded a final round of 70 to win by one shot on a dramatic final day at Augusta, clinching a fifth green jacket but his first since 2005. The 43-year-old has endured injury issues in recent years, raising doubts over his future in the game, but he completed a remarkable comeback on Sunday, much to the delight of those at the venue and millions watching on at home. Tennis star Williams - who has returned to the court after giving birth to her first child in September 2017 - was quick to send out a tweet congratulating her fellow American, admitting she was inspired by Woods' success. "I am literally in tears watching Tiger Woods - this is Greatness like no other," she wrote on social media. "Knowing all you have been through physically to come back and do what you just did today? Wow. Congrats a million times! I am so inspired thank you buddy." Woods is now one closer to the record of 18 major wins held by Nicklaus, who believes the result will provide a huge boost for the sport. Nicklaus tweeted: "A big "well done" from me to Tiger Woods! I am so happy for him and for the game of golf. This is just fantastic!!!"